He has taken some great shots of Venus: enjoy! 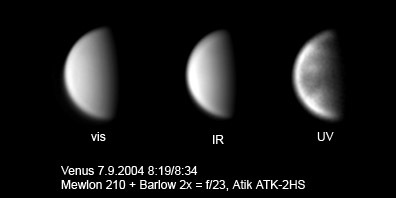 This image of Venus during the daytime was taken with an assortment of different filters. First was visual, second was with an IR pass filter and the third was with Baader UV filter. Just under a thousand stacked UV images of Venus. Equipment used included a Takahashi Mewlon 210 with EM-200, along with Tele Vue 2x APO Barlow lens and a ATK 2HS CCD camera. 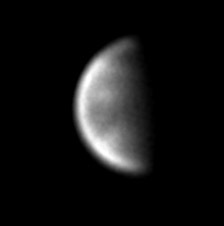 This image of a very thin crescent Venus was taken in summer of 2004 with a SkyMax 102 Maksutov-Cassegrain telescope (f/13) and an ATK 2HS camera. At the time the elongation of Venus was a mere 4.7°! You can check out more of Timo-Pekka's images over at his astrophotography website.